At the bottom of this blog, there’s an inocuous sharing bar with links to share this post on Twitter, Facebook, LinkedIn, HackerNews and subscribe by email and RSS. 1.5% of visitors click on one of these buttons. Despite the similarity of the buttons and the clicks, the value they generate as sharing tools varies dramatically. The chart above shows data from the widget on this blog for the past 30 days, comparing the number of clicks on each button and the traffic that results from that channel. 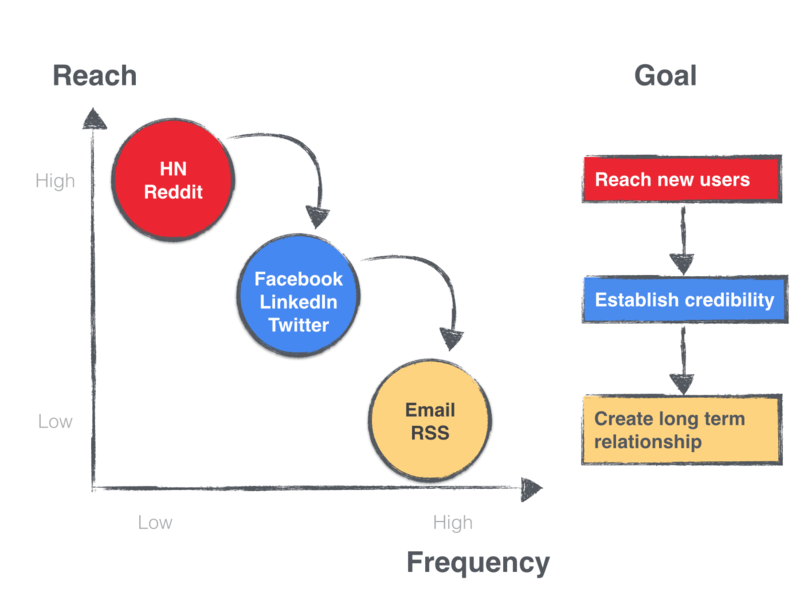 Three traffic generation behaviors emerge from this chart which I call the charts (HackerNews), the networks (Twitter, Facebook, LinkedIn) and the 1-to-1s (Email, RSS). Not many people submit posts to HackerNews, but those clicks generate 3x their share of traffic. 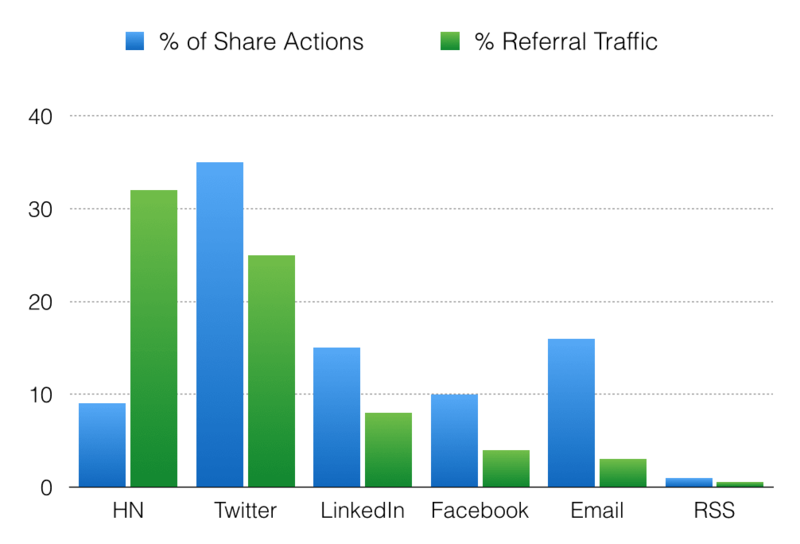 Social networks generate roughly the same share of clicks and traffic. 1-to-1 marketing channels, particularly email, generate more than their share of clicks, but very little traffic by comparison. In other words, it’s a natural funnel. Given these patterns, I’ve developed a mental model for maximizing the value of each channel which is shown below. The goal of this model is to capture as much traffic from the charts and convert those readers into long-term relationships as efficiently as possible. On the left is a chart with reach, the number of users a content marketing channel commands on the y-axis and on the x-axis, the frequency I can engage with those readers. On the right side of the chart, I’ve listed the goals of each content marketing channel. Let’s walk through it in more detail. It’s hard to break into the charts, because everyone with a story wants to be on that list and for good reason. Charts are powerful reader acquisition tools because they provide access to a huge breadth of readers. To maximize the value of the charts, the traffic they generate must be bottled in some way. Social networks provide that bottling mechanism. Social networks amplify content within smaller networks. Likes, RTs and +1s confer social proof, which is one of the most powerful influences on people. That social proof drives new potential readers to become followers of this blog on a social network. 1 to 1 provide a persistent content marketing relationship and immediate addressablity. I can email readers and they can email me. The ultimate goal of every content marketing campaign is to send the right message to the right people at the right time. To do that, I believe in first reaching lots of people, then using the social proof instrinsic to social networks to influence and encourage readers to build a long term relationship. Those grandiose goals all start with a simple little sharing widget.